Derneğimizin İsveçli bir ortakla ve Keçiören Belediyesi ile başvurduğu avrupa gönüllü hizmeti kapsamında 2 genç (20 – 25 yaşları arasında) isveçte 10 Aylığına gönülü eğitimde bulunacaktır. Gönüllülük süresince (1 ekim 2014 – 1 ağustos 2015) yemek, konaklama, ve yol ücreti İsveçli dernek tarafından karşılanacaktır. İlgilenenler, ingilizcesi yeteri derecede olanlar, kendini geliştirmek isteyenler başvurabilirler. Başvuruda CV nizi ve Motivasyon mektubunuzu yollamanız yeterli. Başvurmadan önce detaylı bilgi edinmek isterseniz aşağıdaki bilgileri okuyunuz. As we said we work with integration in different levels. a) Ground Level; we have several activity groups such as language cafe, homework support, sport days, international evenings. These activities are weekly and monthly organized by our. Target group often is local people, immigrant background people or refugees. b) Intellectual Level; we are applying for adult education and youth projects in local and international levels. Erasmus + and Nordplus are main funds that we are working with. In this level youth and adults volunteers became more experienced with projects especially about sharing best practices between project partners. This is a kind of platform for our volunteers that they can prepare activities for ground level. c) Informative Level; we prepare seminars, conferences, panels and handbooks for local people, social workers, teachers, volunteers who can follow updated information about integration and cultures. As a result we aim to reach a goal that all cultures can live in a society in a peace and better understanding. The way to go this goal is to be active citizen. 2. EVS – European Volunteer Service in Sweden. IFALL is cooperating with Turkish organizations for international projects. Kecioren Municipality Directorate of Social Affairs and Faal Derneği are main partners in European Volunteer Service for long-term volunteership in Örkelljunga Sweden. Volunteers will have certain roles in the organization. – to help other volunteers about activity groups such as language café, homework support, sport. – to help some administrative work such as membership registration. 3. Conditions, Requirements and Application. 2 Turkish volunteers will be in Sweden for 10 months from 1st of October 2014 until 1st of August 2015. Accommodation, food, travel to Sweden and visa will be paid by the project. Volunteer also will get some pocket money monthly. – Young people who are between 20 and 25 years old and speak English. It will be positive to speak other languages like Arabic. – Young people who are willingly to go another country and stay there for a period of time, and cooperate with another culture. – Young people who would like to increase self esteem and self development. – Young people who are willingly to work or continue on the same issue with project after return. It will be positive if volunteer lives in Ankara. Send your CV and Motivation Letter to mobility@integrationforalla.se until 25 of July. After the assessment we will invite those who are eligible for a skype meeting therefore we need to have your skype name on your Motivation letter. Örkelljunga is small city which has about 9 000 residents. The town is situated at the south Sweden. 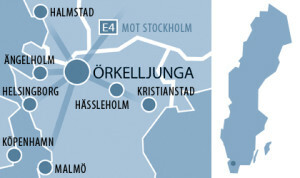 It is located central for reaching big cities in Sweden like Malmö, Göteborg and in Denmark like Copenhagen, Helsingör. Örkelljunga is surrounded by forest and has many lakes. It is possible to make fishing, canoeing, kayak, camping, hiking, and swimming. In Örkelljunga you can find shops, restaurants, supermarkets, medical care, pharmacy, post offices, indoor swimming pool and gym. During the winter months, when it is often cold and dark, it can be a bit more challenging for some volunteers, so it is good to be aware that Örkelljunga is not a big city with plenty of evening activities. 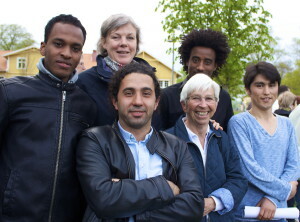 Some volunteers use the weekends to visit other places near Örkelljunga. It is possible to do winter sport nearby which name is Vallåsen Ski Center. IFALL wishes you Good Luck.